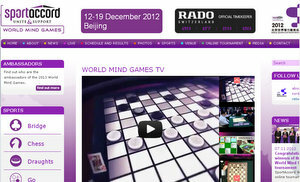 The SportAccord World Mind Games website has a new and updated design, with a number of useful options to improve user’s experience. Visitors can access the latest news about the upcoming event, results, schedule, players’ biographies, and photos, and the website will also have an option to be read in two languages; English or Chinese. During the event – which runs December 12-19 in Beijing — live broadcast coverage will be available through the website as well. The SportAccord World Mind Games are a multi-sports event which highlights the value of mind sports, including go, bridge, draughts, and Chinese chess, featuring the world’s best players delivering top-level performances and creating “new valuable experiences based on intelligence, strategy and exercise of mind,” says SportAccord, the umbrella organisation for 107 international sports federations and organisations. 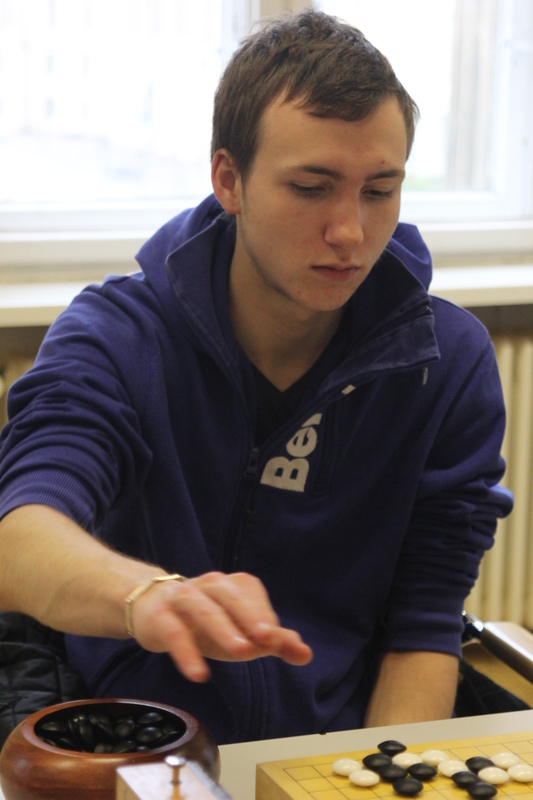 Coventry 2012: The Coventry, played on 11/24 in Warwick University, United Kingdom, was won by Andrew Simons 3d, in second was Siu Fung Cheung 4d and third was Francis Roads 1d… Hungarian Championship Final: The Hungarian Championship Final, played 11/24-25 in Budapest, Hungary, was won by Csaba Mero 6d, second was Pal Balogh 6d and third place was Dominik Boviz 2d… Lithuanian Go Championship 2012: The Lithuanian Go championship 2012, played from 11/23-25 in Vilnius, Lithuania, was won by Giedrius Tumelis 2d, second place was Andrius Petrauskas 3d and third was Paulius Almintas 1d… Go Baron Qualification: The Go Baron Qualification, played from 11/23-25 in Praha, Czech Republic, was won by Ondrej Silt 6d, second was Jan Hora 6d and third was Jan Simara 6d… Turniej w Warsztacie: The Turniej w Warsztacie, played on 11/25 in Warszawa, Poland, was won by Bartosz Klimczak 3k, in second was Pawel Fraczak 4k and third was Jan Fraczak 5k… Welticke Wins Berliner Kranich: Despite losing in Round 3, German Youth Champion Jonas Welticke 4d (at left) won the 2012 Berliner Kranich, played from 11/24-25 in Berlin, Germany; in second was Bernd Schuetze 4d and third was Johannes Obenaus 5d (see EuroGoTV for sgfs)…Berliner Meisterschaft/Endrunde: The Berliner Meisterschaft/Endrunde, played on 11/23 in Berlin, Germany, was won by Johannes Obenaus 5d, second was Ronny Treysse 3d… Russian Championship, Final: The Russian Championship Final, played from 11/21-25 in Sankt-Peterburg, Russia, was won by Ilja Shikshin 7d, in second was Dmitriji Surin 6d and third was Alexandr Dinerstein 7d… Welticke Wins Berliner Kranich: Despite losing in Round 3, German Youth Champion Jonas Welticke 4d won the 2012 Berliner Kranich (sgfs of all games available at EuroGoTV)… Berlin Championship 2012 Final: Johannes Obenaus 5d (at right) successfully defended his title against Ronny TreyBe 3d on 11/23. Obenaus was the first to enter byo-yomi, but was winning on the board when TreyBe lost on time. Both video and sgf of the match can be found on EuroGoTV. Fifteen-year-old Yunxuan Li 5d once again led the pack of youth go players, with a convincing 4-0 record, in the annual Young Lions Tournament, held November 17th on KGS. “The final round of the tournament, with Li facing off against USYGC Champion Aaron Ye 5d, was especially breathtaking, with Li playing an exquisite tesuji combo while under time pressure to save his group from death and clinch the game,” reports tourney organizer Hugh Zhang 7d. 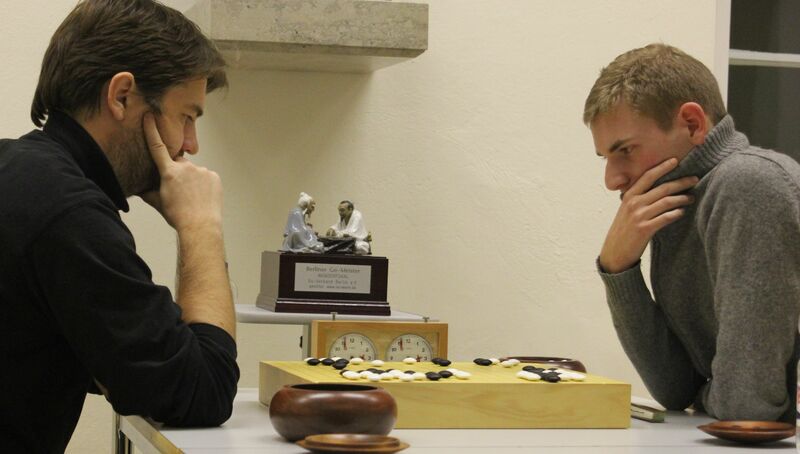 The tournament, hosted by the American Go Honors Society (AGHS), is one of the premier youth competitions in the US. “I think the AGHS did a great job with this tournament,” Li comments, “they kept the tournament organized and fun, and made a good opportunity to play against youth players in America.” Li, as well as second place finishers Aaron Ye and Eric Su 4d, will receive as one of their prizes a free teaching game from newly minted go professionals Andy Liu 1P and Gansheng Shi 1P. Willis Huang 1d, another strong contender in the open division added that “I think the Young Lion’s Tourney was intriguing. It shows the potential younger players [like me] have.” Winners of the Young Lions tournament usually go on to do extremely well in the United States Youth Go Championship. Vincent Zhuang 6d, the 2011 winner went on to win the USYGC, while last year Yunxuan Li nearly made the finals. This year, Li is one of the top contenders and has a strong chance of winning the USYGC and representing the US at the world championships. The American Go Honors Society also hosts the School Team Tournament, in which schools each send teams of at least three players, and fight for the title of North America’s strongest school, more info here. - Paul Barchilon, E-J Youth Editor, with Hugh Zhang. Photo: A crowd gathers to watch Yunxuan Li 5d, at left, in a match with Yoo Changhyuk 9P, at right, at a simul in LA last April. Photo by Wenguang Wu. Plans are underway for a brand-new major go event in the U.S. early next year. Organizers for the North American Go Convention (NAGC) plan to run the event from February 8-17, book-ended with weekend tournaments in New York City (February 9-10) and Washington, DC (February 16-17), with the overall winner declared NAGC Open Champion. Both weekend open tournaments offer 8 rounds of rated games for kyu players, and 6 rounds for dan. Like the annual U.S. Go Congress, the NAGC organizers also plan to include simuls, lectures and game reviews with professional players, who thus far include Joanne Missingham 6P, Stephanie Yin 1P and Myung-wan Kim 9P. Also on tap are Blitz go, Pair Go, awards for top youth, female and senior players and more. The North American Go Convention is sponsored by the AGA Capital Go Club, NOVA Go Club and Days Inn Hotel, and organized by Yue Zhang, Sam Zimmerman, Garrett Smith, Tengxiao Yang, Edward Zhang, Liang Yu, Xiliang Liu, Joshua Guarino, et al. Click here for online registration; groups of 10 or more qualify for a 5% discount. For facility reservation reasons, registration fees will rise 10% after 12/25/2012. The Hedgehog (Le Hérisson), the French film based on Muriel Barbery’s’ novel The Elegance of the Hedgehog (GO SPOTTING: The Elegance of the Hedgehog 5/4/2010 and The Return of the Elegant Hedgehog 10/24/2010) is now available on Netflix for instant play. As in the novel, the main character is a precocious 12-year-old girl who comments acerbically about the adults around her and knows more about go than the father of a friend who is making a movie of The Girl Who Played Go. As Terry Benson noted in our previous report, “She uses go as a philosophic metaphor, saying that ‘One of the most extraordinary aspects of the game of go is that it has been proven that in order to win, you must live, but you must also allow the other player to live. Players who are too greedy will lose: it is a subtle game of equilibrium, where you have to get ahead without crushing the other player. In the end, life and death are only the consequences of how well or how poorly you have made your construction. This is what one of Taniguchi’s characters says: you live, you die, these are consequences . It’s a proverb for playing go, and for life.’” This dialogue is retained almost verbatim in the film. Lee Sedol 9P seems to be fully recovered from his slump earlier this year, pulling off a classic hat trick in the Olleh Cup by defeating Choi Cheolhan 9P 3-1 in the final for his third straight Olleh championship title. It also makes Lee the only winner in this all-Korean tournament, which started just three years ago. In 2010 he defeated Kang Dongyun 9P and Lee Changho 9P in 2011. The final game was an exciting contest showing how professionals consider the whole board situation when playing and both sides fight for life throughout. The Olleh Cup not only features the best Korean players but also hosts a children’s tournament. 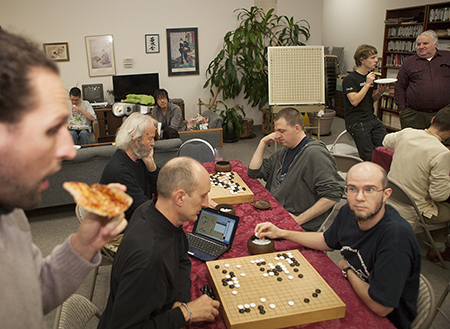 The 2012 International Go Symposium in Black Mountain, North Carolina attracted leading scholars and researchers from around the world for two days of presentations and discussions on the many aspects of the game of go. Dozens of hours of footage have now been edited down and posted online to accompany the conference papers. This 3-part series covers highlights of Symposium presentations by teachers, scientists, historians and anthropologists. 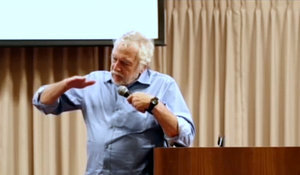 Games may be a major key to learning, suggested keynote speaker Nolan Bushnell (right) at the 2012 International Go Symposium, August 4-5, 2012. The entrepreneurial wizard behind products as diverse as Atari and Chuck E. Cheese, Bushnell is now applying principles such as “thalamic engagement” and “spaced repetition” to develop Brainrush, a game-based learning app that aims to help students learn all kinds of material more effectively. Mexican Go Assoiation President Israel Rodriguez offered some interesting speculations on the nature of the barriers to developing a go culture. 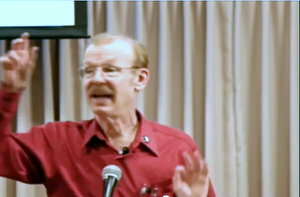 Yet go is a superb medium for growth and development, as Dr. Roy Laird – a clinical social worker who manages treatment programs for The Children’s Aid Society in New York City and former President of the American Go Association – explores in his talk “Play Go And Grow,” about the unique aspects of go that favor positive development, and some interesting recent research on go and the brain. 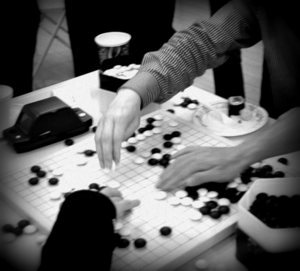 While go is popular in Asian communities and has developed a growing base among Caucasians in the West, its presence is very limited in other Western cultures. In Playing Under and Pushing Through the Stones, Roxanna Duntley-Matos, a member of the Western Michigan University School of Social Work faculty, describes how she used go as a tool for “emancipatory education” with the Ann Arbor Hispanic community, promoting leadership, camaraderie and success among a marginalized minority. At the upper end of the learning spectrum, Peter Schumer described a for-credit course on go that he has taught at Middlebury College for years, offering tips on everything from curriculum development to teaching style. In “How Rules, Terms and Attitude Help or Hinder the Game,”, American Go Foundation (AGF) President and AGA Rules Committee Chairman Terry Benson (left) urges a rethinking of what it means to “play go,” and what we teach. Peter Freedman, an experienced go teacher from the Portland area, looked beyond simply teaching children the game to how to help them develop a lifelong love for go, while go teacher Siddhartha Avila’s Mexican school is committed to teaching through the arts. On a practical level, AGF VP Paul Barchilon outlined some of the many ways that the AGF can help aspiring organizers in the US. Laura Martinez ended the go teacher’s panel, and the conference, by unveiling the winners of The Second International Go Art Contest. The AGA and the 2012 US Go Congress are extremely grateful to the International Go Federation for financial support that made this event possible, and to the American Go Foundation for additional support. All presentations can be found at the Symposium’s YouTube channel. In addition, links to all the videos and to associated papers, links and contact information be found at the Symposium website. NEXT WEEK: Historians and anthropologists at the Symposium. With Go World ending publication (Endgame for Go World Magazine After 35 Years 11/16) we want to know which was your favorite Go World article. Click here to participate in the My Favorite Go World Story Contest. Page through your hard copies for reminders of all the great content over the years, or check out Go World’s handy Index for Go Worlds #1 to #122 if your memory needs jogging. Three winners will be selected to receive a choice of three GW issues, courtesy of the American Go Foundation. Deadline is 6P on Sunday, December 2. We have all had this experience in our own games. 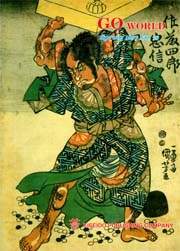 Right from the fuseki, the game looked to be in your favor, you have the fights in control and the lead is obvious and solid. Then it happens. The self-atari, the missed sequence, the time- pressure mistake. That you could so easily have avoided the mistake only deepens your dissatisfaction and regret. I can’t tell you how to prevent these mistakes, which even happen to professional players. But there is something you can do about what happens next. The emotional turmoil after such a mistake often causes more losses than the blunder itself. When you’re in control of a game your brain moves like a train. Straight. Direct. Unstoppable. When the blunder happens, it’s like getting derailed. It feels like a total disaster and can cause a great shock. Our sense of the balance of the game gets skewed by nostalgia for the position before the mistake, we get angry and then we play badly. How many games have you seen where even after a mistake the player who blundered was still winning, but lost perspective, control, and the game? This is about emotional control. It is of utmost importance not to get upset. Controlling your emotions is hard, but is absolutely necessary if you want to win more games. Your resolve must stay steady, and you must always look for the best way to play. You will notice that professionals and ex-inseis have a formidable control over their emotions. The pro system quickly disposes those who don’t handle their emotions well, providing evidence that emotional control counts for a lot more than we may think. My advice: In any kind of emotional rush during the game, whether due to a mistake or even excitement, I recommend taking a break, even for as little as thirty seconds. The purpose of the break is simply to calm your emotions, control them, get them back in check. It’s just too dangerous to continue playing a game when your perception is blurred by heightened emotions.